Written by: Eleanor Richards | August 26, 2016. A stylish watch is an accessory every man should have. If worn correctly, it can really bring your outfit to life, and pairs well with almost anything. Depending on the style you go for, and whether you choose just a basic watch, or a fitness tracker, they can help you with much more than just telling the time. At Mainline Menswear, we’re all big fans of watches. We’ve been checking out people’s wrists, and are bringing you a list of our top watches. We’ll also tell you how to wear it, and what it looks best with – to ensure you get the most out of your money. The first thing to get right with your watch is the fit. If your watch has links, you can take it to any local watchmaker or jeweller to get it correctly fitted. However, with a leather or material strap you need to get the fit right before you buy it. Your watch should be loose enough to slide about an inch down your arm, but no further. Also, if when you take it off there is a deep imprint on your wrist, then you’ve got it too tight. Generally, most people tend to wear their watch on their wrist of the non-dominant hand. So if you’re right handed, you’ll wear it on your left. When you’re wearing a shirt, or something long sleeved, about half of the watch face should be visible below the cuff. Most people will wear their watch with the face facing upwards. However, there really are no set rules on which way up it can be. Follow these rules if you want to fit in with the rest of the crowd, but if not feel free to get creative. The great thing about watches, is that they can pretty much be worn with anything. 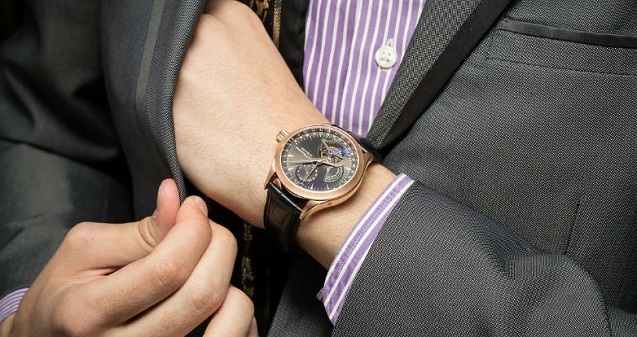 Wearing a high quality, designer watch with a suit will make you look like a classic gentleman. At the same time, accessorising simple jeans and a t-shirt with a nice wristwatch will take your outfit from a relaxing weekend look to smart casual attire. They really are the most useful accessory you can have. Many smart watches these days will do all sorts of things for you too. From telling the time, to receiving your emails, to tracking your schedule. A man with a good watch is unstoppable; stylish and prepared for anything. Choosing whether to go with a metal or leather strap depends on what you’re going to be doing. Metal is much more structurally sound and reliable. It’s waterproof and will deal much better with rigorous wear and tear than a leather strap will. You can also polish metal watches to make them look almost new again, unlike leather straps. However, it’s not as breathable and tends to heat up or cool down depending on the surrounding temperatures. A leather strap looks more stylish than metal, and is the best option for if you’re dressing up or going out. But leather straps are more susceptible to damage and harder to maintain. You should treat a leather watch like you would a leather jacket. Keep it protected and avoid exposing it to extreme elements too much. 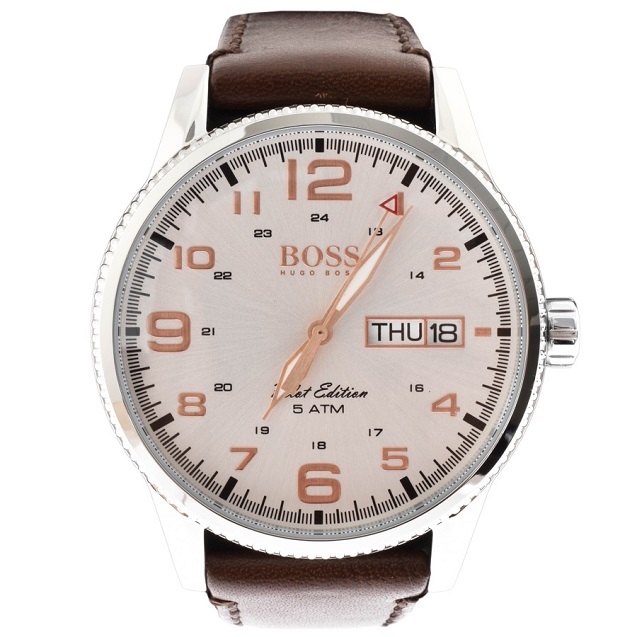 At Mainline Menswear, we stock watches from many top designer retailers, including Hugo Boss and Casio. With varying watch faces and straps you can find a unique style to suit you and pair with whatever outfit you’re wearing. 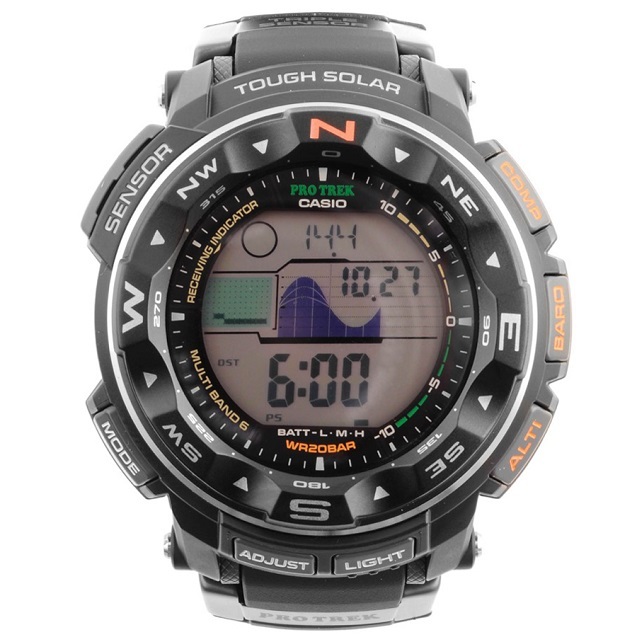 Our top watch for outdoor activities is the Casio Pro Trek. It has a glass face and rubber strap, which is easy going on the skin and flexible to create a comfortable fit. The watch also has numerous functions in addition to telling the time; including tide times, a compass and an altitude sensor. This is the ideal watch for a true adventurer, giving you everything you need to navigate the outdoors. If you want a watch with a metallic strap, the Hugo Boss Supernova has a stainless steel strap and a circular face in a contrasting rose gold colour. This watch is eye-catching and stylish, meaning it can be used as a statement piece within an outfit. 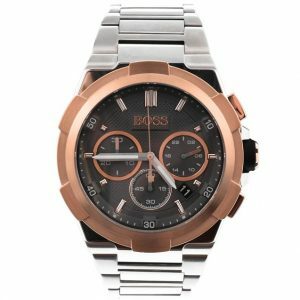 From the Hugo Boss Black line, this is one of the smartest watches Boss produces; a true investment you can keep for years. Finally, our favourite leather strapped watch is another Hugo Boss Black classic – the pilot vintage watch, with brown leather strapping. The vintage design features large numbers in rose gold, with silver sun dial-esque hands. The watch also displays the date and is water resistant up to 50m, so is not only stylish but practical as well – the model mix. If you want to shop for a new watch, look no further than Mainline Menswear. We also sell numerous other accessories, including sunglasses, bags and gift sets. This is in addition to clothing, of which we have thousands of items to suit any man for any occasion. Visit our website here to browse our extensive range of stock.